Home » Uncategorized » We’re recycling and composting to the max to strive for Zero Waste! 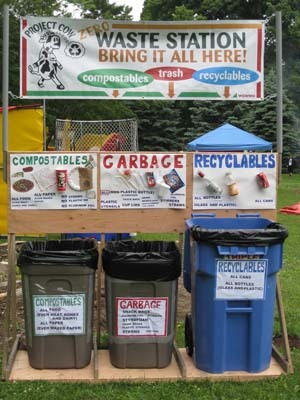 Please help us compost, recycle, and strive for Zero Waste by not throwing anything “away” at Stroll events! We’ve asked our vendors to help out by providing easily recyclable food containers and utensils. (Look for “EcoVendor” signs at participating vendors!) After you consume their delicious offerings, please do your part by recycling everything that’s recyclable! Plastic, glass and metal — including caps and lids! Trash — there shouldn’t be much of this! At the Zero-waste stations, you’ll find a volunteer to help you sort things out. True “Zero Waste” is still out of reach, but we’re aiming for 80 percent recycling, 20 percent waste — or even better! Please help us get there!